Mount Everest experience mountain flight is very popular touristic activities in Nepal Himalayas. Everest view mountain flight is recognized as a Everest experience mountain flight is one of the world’s most exclusive mountain flight private day tours, is a lifetime experience. Furthermore, a flight that takes you deep into the Himalayas, flying into the valleys close to the rock face. As you are flying over the Himalayan horizon, you can feel and see the stunning beauty of nature. With in an hour of seating into the aircraft, you can see almost all the tallest Mountains including Mt. Everest (8848m), Nuptse (7879 M), Lhotse (8501 M), Cho Oyu (8000M), Makalu (8475 M) and Kanchenjunga (8584 M) which is very worthy to explore. 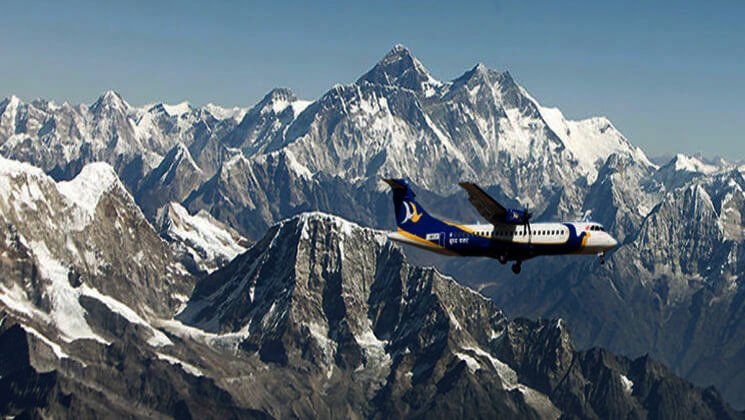 Why to choose an experience Mt.Everest mountain flight in Nepal with either Yeti Air or Buddha Air? Buddha and Yeti airlines have a best and latest features aircraft which will take you higher to get amazing scenery of all those tallest Mountains. They are safer and better in their aviation history. Everest mountain flight tour in this section, you can explore the mount Everest view including several other tallest Mountains from your seat of mountain flight, designed for those who are having limited time for their stay or for those who don’t want to leave Nepal without touching the sacred and majestic Himalayas. Book your early mountain flight to watch about mount everest from plane. Search yeti airlines mountain flight price to explore the tallest mountain summits. You can also choose Everest helicopter flights from Kathmandu to make your trip more special. Everest experienced Himalayan flight is enjoyed by thousands all the year round, through our experience. Flying Cost and Schedule subject to be change with or without prior notice. Depend on Weather Condition. It would be our pleasure to present you the certificate of honor for the trip which we are sure going to be beyond the imagination. The best view of tallest Himalayas Everest 8,848m, Shisa Pangma 8,013m, Dorje Lakpa 6,966m, Choba Bhamre 5,933m, Gauri Shankar 7,134m, Menlungtse 7,023m, Numbur 6956 m, Karyolung 6511m, Cho Oyu 8201m, Gyachungkang 7952m, Pumori 7,161m, Nuptse 7855m. 55 minute to 1 hour window seat guaranteed to explore those tallest mountains. What are the Everest mountain flights from Kathmandu schedule?. 8.30 AM – 3 rd Flight / EVERYDAY Monday through Sunday (7 Days a Week). How much is the Everest mountain flight cost?. Nepal mountain flight ticket cost is only USD 185 Per person for foreign nationals. But you will get seasonal discounted price on email request. Have in mind, there will be 55 minute (roughly 1 hour) guaranteed flight and all of you will get private window. What about the Everest mountain flight cancellation policy?. In case, if the weather is bad, and if there is no way to get fly because of bad weather, they announce for cancel. Likewise, if you couldn’t see mountains while you are flying, your aircraft air hostess – Pilot announce that the flight gets cancel because of bad weather and cloudy. Make sure that we can reschedule your flight in next days or full amount of money back on your request. Nepal Everest experience mountain flight, great weather ! We were a group of 8 people (six Germans & 1 British couple) started a trip to Nepal in last April, 2018, sadly we had only 3 days staying in Kathmandu. Ammar customized our travel holiday including Kathmandu valley tour, 1 days pokhara city tour combing with 1 hour Everest experience mountain flight. It was a great trip of my life as i never seen such a beautiful Himalayas and tallest mountains in a range just next to me. Really impressed flying into the Everest closely. Price was resonable and the weather was great and blue sky all the time. Ammar as our best guide ever for our city tour, thank you for his help guiding us.